OHM LOADS INC. introduces the KWATT series, a comprehensive line of high power unregulated DC and AC power supplies for bench-top and rack-mount applications. The KWATT series is adjustable using a variable output voltage control dial, supplying a source of 0-1.3KW DC or 0-2KVA AC power in a single unit. The OLP24V ranges from 0-24VDC and 0-20VAC. The OLP75V ranges from 0-75VDC and 0-55VAC. The OLP175V ranges from 0-175VDC and 0-125VAC. The OLP350V ranges from 0-350VDC and 0-250VAC. The input ranges from 105-130VAC. All models feature over-current protection. The front panels feature output DC/AC selection switch(es), a variable output voltage control dial (0-100%), DC and AC analog voltage and current meters and an AC power switch. The rear panels feature 3/8¿ bolt-type or five-way banana jack binding posts for output connections, a world standard IEC AC input connector, input/output panel fuses and/or output breakers. The floating output allows for positive and negative output application flexibility. Maximum output ripple is 1.5% rms. All units are convection cooled except the OLP24V, which has a small 115VAC fan. All units can be run at full rated power from 0-40 °C, linearly derated to zero at 70 °C. All these features are packaged in standard bench-top/19" rack-mount chassis (17.5"W x 8.75"H x 15"L). 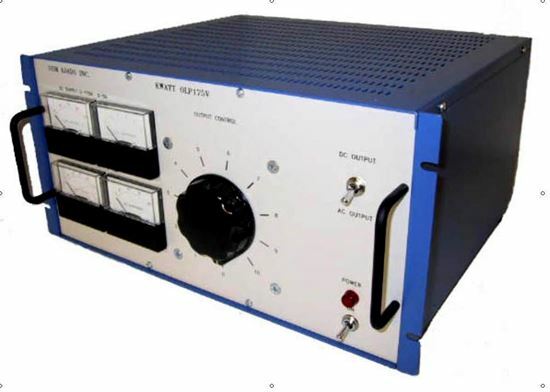 Applications for the KWATT series include R and D testing, trouble-shooting, production testing, in-coming inspection and burn-in of transformers, motor drives, lamps, relays, actuators, servo controls, steppers, DC-DC converters, DC-AC inverters, power systems, magnets, amplifiers, etc. Useful everywhere an extremely rugged, reliable and economical versatile DC and AC power supply is required. The KWATT series is ideally suited for applications where tight regulation is not needed, but cost and reliability are important. Since KWATT is unregulated it will not interact in any way with the loads connected to it. Unlike most regulated supplies, KWATT is very RUGGED with a high overload specification and is forgiving during misuse. The KWATT series is also very economical when compared to regulated power supplies or "in-house" built units. When companies build their own "in-house" power supplies many associated costs are overlooked. These "hidden" costs such as engineering and development time, manufacturing, documentation, trouble-shooting and maintenance, overhead, purchasing, etc. can make these "in-house" supplies very expensive and divert valuable time away from the company's main products. KWATT has power for virtually every application covering most voltages and currents eliminating the need to build "in-house" supplies. The KWATT series provides the user with an unparalleled amount of flexibility and ease of use. Simply hook-up the load.